What can you do if the house you want to buy is just a little bit more expensive than the biggest sum you’re allowed to borrow, based on your income and credit history? Don’t worry, there’s a way out of this tight spot, provided you have someone to help you out. Some types of loan (not all, depending on the institution which is borrowing you the money) allow people to also include a co-borrower or a co-signer in the contract, if one’s income requirements are not met. 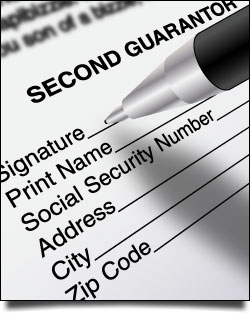 Only specific programs allow a co-signer, but it will be easy to find the ones that do. This kind of possibility means that if the would-be home buyers don’t qualify for accessing a bigger loan which would allow them to purchase the house they want, they can include someone else in the deal to share the financial burden with. This extra person can be a co-borrower or a co-signer, and the two are quite different. A co-borrower shares the responsibility for the loan taken, but also takes title in the property purchased, is obligated on the mortgage note and so on. A co-signer has fewer rights than a co-borrower, cannot have any kind of interest in the property, but shares the financial responsibility with the owner nonetheless. Both these kinds of helpers must pass the same kind of scrutiny before getting approved, to see if their credit history and income requirements meet the standards. Banks don’t review only the co-signer’s income, but also their previous debts before approving. In many cases, this sort of agreement is a way for an established borrower to help out a less established one, especially if the people needing help are relatively young first time home buyers. What’s even better is that the arrangement can improve the credit score for both the owner and the co-signer, on the long run. Having a co-signer (or a co-borrower) can improve your chances of getting approved for a mortgage you couldn’t normally access otherwise. Usually, the informal agreement between first time home buyers and their co-signers take for granted the idea that the co-signer won’t actually be participating in paying the mortgage or the bills or living in the new house. Still, the law doesn’t exclude this possibility (which is why the co-signer is even required to be thoroughly informed of all these costs), so it’s better to have your attorney sketch a draft of a contract which will clearly state your arrangement, so to avoid any future surprises. Since being a co-signer for a mortgage usually means entering a long term binding legal agreement, many people don’t like the idea or find it too risky, unless they are close relatives. This is exactly why the most encountered situation is that where the co-signer for a new mortgage is one of the owners’ parents or a sibling. Even more, some of the restrictions placed on a co-signer’s status (like the fact that he or she cannot have interest in the property) are lifted when the co-signer is related to the owner by blood, marriage or law. Officially, the only requirements for a co-signer is that they are at least 18 (age of majority) and that their income requirements are met, as well as the credit history looking good. In reality, it might be hard to find a co-signer for your new mortgage, unless you convince a spouse, sibling or parent to participate. In any case, co-signing is becoming more and more a way for first time home buyers to solve the problem of not being able to access the home they want. This sort of arrangement could help you get approved for the mortgage you need without waiting for an indefinite time until you get all the extra raises which would allow you to take the loan by yourself.